St Nicholas Manor comprises a selection of contemporary designed two, three and four bedroom homes in a range of designs which start in price from £139,995 and will appeal to families as well as first time buyers. “All the new homes benefit from a contemporary architectural theme and incorporate desirable design features, such as open-plan living spaces, integrated kitchen appliances and en suite shower rooms. Outside, all have garages, or private parking and all include gardens,” he confirmed. Buyers at St Nicholas Manor, will be able to benefit from a range of Bellway’s incentives including the Help to Buy scheme. For families, there are a number of well-regarded local schools including Shanklea, Beaconhill and Cramlington Village primary schools for younger children and Cramlington Learning Village for older students. Post-16 education providers include Tyne Metropolitan College in Wallsend and Newcastle College. Shopping locally is focused around Manor Walks and the adjacent retail park, which features a good selection of high-street and independent stores, niche retailers and artisan food retailers. Additionally there is a multi-screen cinema and leisure centre. Slightly further afield the Silverlink Shopping Park offers a range of chain stores, restaurants and cafés, while Newcastle city centre, and the Metrocentre in Gateshead, attract shoppers from across the region. Cramlington enjoys an abundance of green open space, with several parks locally including Alexandra Park, which offers football pitches, tennis courts, and a children’s play area and a skatepark. Plessey Woods Country Park, Bedlington Country Park and Weetslade Country Park are home to a multitude of wildlife and are only around three miles from the development. For commuters, St Nicholas Manor is situated a few minutes’ walk from Cramlington Railway Station, from where regular trains run to Morpeth, Gateshead Metrocentre and Newcastle. The Northumberland coast, can be reached in around five minutes by car and Newcastle Airport is 11 miles away via the A1. 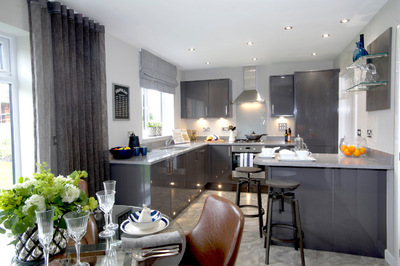 For further information regarding these new homes in Cramlington, visit bellway.co.uk.